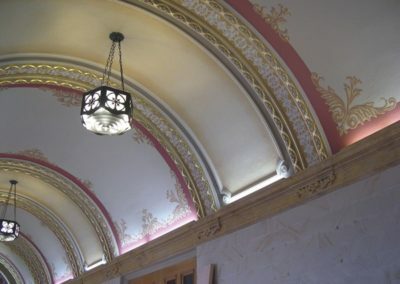 To restore the elegance and spiritual continuity of the sanctuary decoration of Holy Cross Catholic Church,in Minneapolis, Minnesota, built in 1886. Returning the glory will enhance the exceptional interior that includes historic stained glass windows, imported Italian columns and fine mural work. Over time, repairs and color palette modifications diminished the decorative elements that had once graced this elegant building. 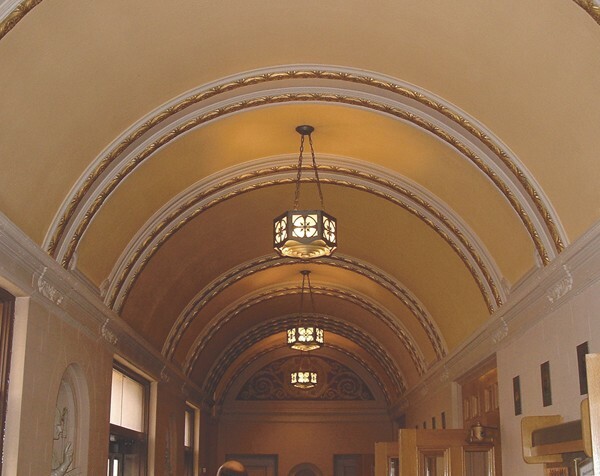 Studio artists began by providing a more ornate decorative scheme, sympathetic to the original, in the vestibule. This serves as an inspiration for renewing the decoration in the sanctuary, and throughout the church, highlighting the architectural elements and providing a more uplifting atmosphere. 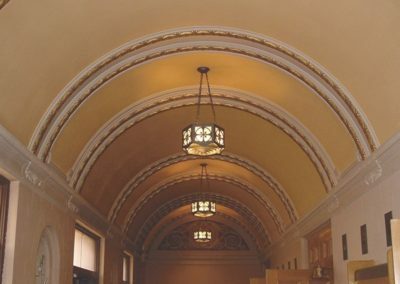 Planned improvements to the body of the church include the application of a faux finish to make the walls, frieze, and pilasters appear as stone. Intricate stencil designs, glazed and gilded reliefs will highlight the architectural details and create an inviting, inspirational worship space. The Polish heritage parish will be beautified prior to its 125th anniversary in 2011.